Prayer For Five Year Old Landen.. The family of the little boy who was thrown from the third floor is asking for prayers for their son. They’re asking for privacy so I’m not running his picture. Here’s a vetted GoFundMe, according to reporters from Minnesota. It’s not clear if it was a hate crime or if the guy who did it was just mentally ill. The little boy was white, the attacker was black. 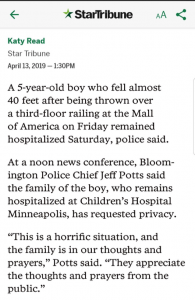 The attacker, Emanuel Deshawn Aranda, does have a past history of throwing things from the balcony of the mall previously and had been banned.